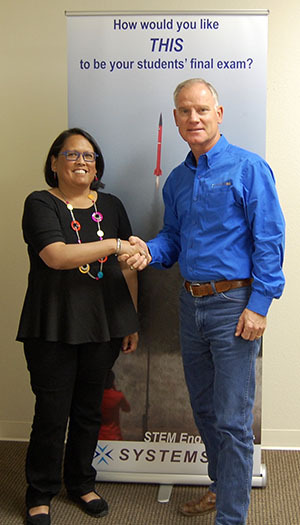 Dayni Alba, Community Investor, Texas, for Boeing Global Engagement, announces the awarding of Boeing’s Our Future: Tomorrow’s Innovators grant to Scott Netherland, Executive Director of SystemsGo. For release Nov 17, 2017–The Boeing Company has announced the awarding of a grant to SystemsGo, the Fredericksburg, Texas-based nonprofit organization that provides curricula and training in science, technology, engineering, and math (STEM) education to students in Texas, New Mexico, and Oregon high schools. SystemsGo is an innovative program recognized for having high school students design, build, and launch rockets. The program was developed at Fredericksburg High School in 1997 and is now used in high schools across Texas, New Mexico, and Oregon. The funds will help expand the SystemsGo program in areas where Boeing employees live and work around the Metroplex. SystemsGo is the recipient of one of 188 grants provided this year through Boeing’s Our Future: Tomorrow’s Innovators, targeting increased STEM diversity, proficiency and interest among K-12 students. This grant is part of more than $50 million in grants to more than 500 nonprofit organizations across 50 countries globally. SystemsGo offers a four-year STEM curriculum that features a project-based approach to learning. Students move from designing and building small model rockets as well as vehicles that loft a one-pound payload one mile high. The next level involves reaching the sound barrier. Every spring, teams gather to launch the rockets they designed and built. The highest level requires students to design and build a rocket that launches at the U.S. Army’s White Sands Missile Range. This rocket is designed to loft a scientific payload to 80,000 to 100,000 feet. The program has been featured on NBC Nightly News and is certified by The Space Foundation.